The first recorded meal eaten by Europeans in Australia was Stingray served with warrigal greens aboard the Endeavour; the Ray was caught in Botany Bay, which Captain Cook initially called Sting-Ray Bay. Joseph Banks noted in his journal that: “...the fish itself was not quite so good as a scate nor was it much inferior...”. Rays, along with Sharks, are cartilaginous fish, with a skeleton made of cartilage rather than bone; such fish are ancient, pre-dating today’s bony fish on the evolutionary tree. Rays differ from Sharks in that their pectoral (side) fins are greatly enlarged and attached to their heads, often forming a large disc shaped ‘body’, to which a much smaller (often thin, whip-like) tail is attached; most are bottom dwellers as their flattened shape suggests. The term Ray is used to refer to over 600 species worldwide, including some of the largest fish in the ocean; most belong to the order Rajiforms, which is divided into three main groups ‘true’ Rays, Skates and Guitarfishes. Rays have flattened oval or diamond-shaped discs, mostly with very thin tails with stinging spines on them. They’re found right around the Australian coast, generally close to shore, can grow to almost 9 metres long (including their tails) and weigh over 350kg, though they’re typically sold at less than 50kg. Stingrays (Dasyatidae family) are among the largest Rays, with some more than 2 metres wide and weighing over 350kg. There are 22 species in Australian waters including: Smooth Stingray (Dasyatis brevicaudata), Black Stingray (Dasyatis thetidis), Whiprays (Himantura species), Maskrays (Neotrygon species), Fantail Rays (Taeniura species) and Pelagic Stingray (Pteroplatytrygon violacea), one of the few Rays that is not bottom-dwelling. Stingarees (Urolophidae family) are relatively small; they have a similar body shape to stingrays, with a shorter (not whip-like) tail ending in a well-developed fin. The much larger Giant Stingaree (Plesiobatidae daviesi) is in a family of its own. Eagle Rays (Myliobatidae family) are medium to large with a long, thin, whip-like tail, wide diamond-shaped disc and protruding head, giving their pectoral fins a wing-like appearance. Of the five species in Australian waters only the Southern Eagle Ray (Myliobatis australis) is commonly eaten; found around southern Australia from Moreton Bay (Qld) to Jurien (WA), including off Tasmania, it grows to over 100kg and 1.6 metres wide. Butterfly Rays (Gymnuridae family) have diamond-shaped bodies and very short, thin, non-whip-like tails. Australian Butterfly Ray (Gymnura australisi), the only species in Australian waters, occurs north from Broken Bay (NSW) to Shark Bay (WA) and is often caught by Prawn trawlers and sold as ‘Skate’. Skates (Rajidae family) have a roughly diamond-shaped disc, attached to a thin, relatively short tail that is thicker than Rays’. They generally have sharp, thorny protrusions along their backs (which some Rays also have) but no stinging barbs, and a pointy, sometimes elongated, snout. They live in much deeper waters than Rays and Guitarfish and are abundant on the continental shelf and upper slope off southern Australia, occurring around most of the coast except for the very north. There are at least 25 species in Australia, some of the most commonly seen are: Sydney (Dipturus australis), Melbourne (D. whitleyi), Grey (D. canutus), Whitespotted (D. cerva) Longnose (D. confuses) and Thornback (Dentiraja lemprieri) Skates. Wedgefishes (Rhynchobatidae family) are large, up to 3 metres long, with pointed heads distinct from their large pectoral fins. White-spotted Guitarfish (Rhynchobatus australiae), found around the northern and western coast of Australia from Coffs Harbour (NSW) to Fremantle (WA) is the most common. Shovelnose Rays (Rhinobatidae family) are generally smaller with head and pectoral fins joined to form a disc. Several members, referred to as Fiddler Rays, have oval discs, including Eastern (Trygonorrhina fasciata) and Southern (Trygonorrhina dumerilii) Fiddler Rays. The rest have the classic pointed, shovel-shaped disc that gives the family its name, including Eastern (Aptychotrema rostrata), Western (Aptychotrema vincentiana) and Giant (Glaucostegus typus) Shovelnose Rays. Caught mainly as by-catch, these fish represent very good value. 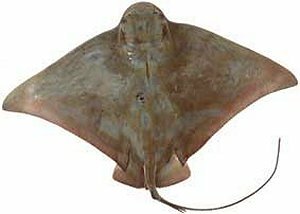 There’s little, if any, differentiation between species in the market; it’s generally the pectoral fins of Rays and Skate that are eaten and the names ‘flaps’ and ‘wings’ tend to be used interchangeably for Ray and Skate fins. Smaller fish are more tender than larger ones, and it is normal for the flesh to gape a little in long strands. The tail meat of Guitarfish is generally pale pink with dark red muscle bands and is always sold skinned; they’re commonly sold around 1-2kg though they can grow much larger. Refrigerate for up to 3 days or freeze for up to 3 months, at -18ºC or lower. The blood of all cartilaginous fish contains urea, which gives their flesh a slight ammonia smell once they are dead, this is normal and disappears with cooking. Ray and Skate are very popular in Europe and parts of Asia, but are less commonly eaten in Australia; with cartilage rather than bones, they are ideal for children and people who find fish bones annoying. The central cartilage in Skate and Ray fins is easy to remove, either before or after cooking, and any small pieces of cartilage soften with cooking and can be eaten. They generally have a mild flavour, low oiliness, medium-firm texture and are moderately moist. The meat is reasonably forgiving and will remain moist even if slightly overcooked. It can be steamed, poached, deep-fried, stir-fried, baked, or barbecued and works well with acidic ingredients such as citrus, tomato, cider and vinegar. Guitarfish has a slightly stronger flavour and similar firm, moist texture, making it ideal for kebabs, curries and stir-fries. Skate nobs, nodules of flesh cut from Skate tails, are popular in the UK.